Global Curcumin Market size was worth over USD 46.6 million in 2016 and will surpass USD 110.5 million by 2024. Rising consumer health consciousness due to presence of artificial ingredients in food, medicines, and cosmetics are key aspects influencing the industry manufacturers to adopt for organic ingredients in the product formulation. 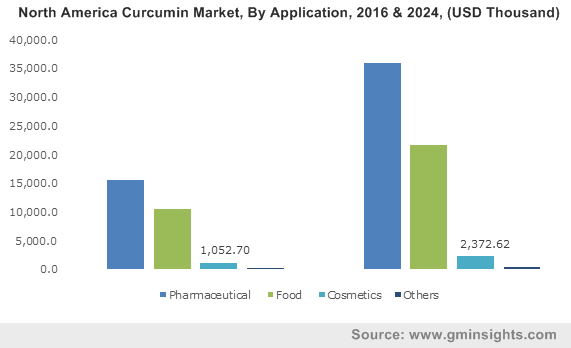 Presence of anti-cancer, anti-inflammatory and anti-oxidation properties in medicines and cosmetics will drive curcumin market growth. For instance, Global cancer drug industry has exceeded USD 100 billion in 2015 and is ecpected to reach over USD 140 billion by 2024, with the U.S. being major consumer. Increased applications in textile market will enhance industry growth owing to its effective spot removal property. Enhanced sutures & implantable patches and gauge to cover stain for soft tissue repair will support the product penetration. Increased product usage in handlooms, carpets, bed spreads, towels, dhotis, printed fabrics and sarees will significantly drive the global curcumin market expansion over the forecast period. Growing preference for healthy and natural food products among masses will improve demand for curcumin in various food applications. Traditional values attached with the product in the Hindu culture will also propel product demand over the forecast period. Several western countries including Canada and Ireland are increasing adopting turmeric juices and alcohol due to growing popularity among health-conscious consumers and this in turn will support product penetration. Increased application of product in treatment of several severe diseases including, cancer and Alzheimer is expected to provide lucrative opportunity to curcumin market. The demand for product in skin care applications including prevention from ringworm, leech bites, eye infections, skin sores, skin for pain, sprains & swellings, bruising and gum diseases will propel industry growth. Emergence of innovative products along with technological advancement will boost the product market size. However, advantageous properties of the curcumin in the medicine are very well established, but its therapeutic potential so far has been limited due to its poor bio availability. This may hamper the product penetration in forecast time. Pharmaceutical applications was valued at over USD 20 million in 2016. Increased demand for curcumin based supplements is expected to propel the product demand in this application segment. Increasing research and development initiatives by various manufacturers and researcher due to growing demand for natural ingredient based medicines will propel pharmaceutical market. From past few years, increasing demand for its unique therapeutic qualities in ayurvedic medicinal formulations has upsurge the industry expansion. Food applications will witness gains at 12.2% up to 2024. Continuous product development and innovation in food industry will drive the product demand in this segment. Rising scientific proficiency coupled with large network of biotechnology and food chemistry is anticipated to produce high quality curcumin improving the future sales margins. Moreover, commercial feasibility and end usage of product is the prime focus of the researchers. Cosmetics applications will be valued over USD 5 million by 2024. Increasing curcumin extract usage in various cosmetics formulations owing to its antioxidant feature is projected to propel the product demand. Some of the significant cosmetic products include shampoo, foundation, oil serum, radiance masque, formulated primer conditioning lip balm, vitality elixir and muscle gel. Further, rising pollution and exposure to ultraviolet (UV) radiation is expected to propel the product demand as the product offers antioxidants to skin that provides protection. North America market was valued at over USD 25 million in 2016. Increasing demand for the curcumin based supplements in the region, particularly in the U.S. for enhancing several health problems will support the product scope. These supplements are broadly available on over-the-counter (OTC) without the existence of any specific norm and thus have a huge growth potential in the region. Europe market will foresee gains at 14.6% up to 2024. The Europe market is anticipated to witness high growth rates owing to increase in consumer spending on pharmaceutical and food products along with positive regulations enhancing its overall market. European Food Safety Authority (EFSA) regulations to include turmeric in commercial food category coupled with increasing research and development initiatives for cancer treatment are vital factors fostering regional demand. Asia Pacific market was valued over USD 5 million in 2016. 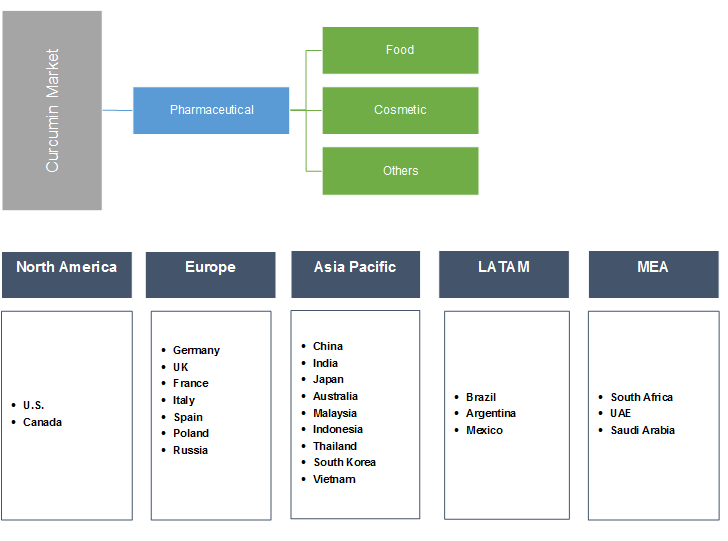 The region is an emerging area for the product market owing to the growing demand from cosmetics skin care manufacturers whose herbal and natural ingredient products are gaining fast penetration in European and North American markets. Curcumin producers are generally concentrated in India owing to high content in Indian turmeric variabilities and close proximity of several raw material suppliers. Furthermore, production is mostly dependent on turmeric production that is majorly dominated by India, that produces more than 80% of the global production. Global curcumin market is fragmented with the presence of various international and local players in the industry. Prominent manufacturers in across the world include Biomax Life Sciences, Synthite Industries, Hindustan Mint & Agro Products, Herboveda India, SV Agrofood, Arjuna Natural Extracts, Konark Herbals & Health Care and Helmigs Prima Sejahtera PT. Market distribution channels for curcumin are changing hastily owing to manufacturers building shorter supply chains over which they exercise more control. These is done by cooperation of exporters and producers in countries of production, by incorporation, and by skipping middleman in the chain. It is a well-recognized ingredient in pharmaceuticals for its high quality medical and herbal characteristics. Supplements based on this products are generally used to treat people suffering from tumors, gastric ulcers, arthritis, diabetic wounds and anorexia and sinusitis. Curcumin is derived from turmeric and globally, the demand for turmeric is increasing. The industry is witnessing fierce competition, especially from suppliers present in the Asian countries. Therefore, companies are continuously upgrading their production and processing scale to gain competitive advantage in the industry. Key manufacturers are expected to integrate business operation including, cultivation, processing and marketing. Overall research & development initiatives by numerous research organizations in close cooperation with the manufacturing players is anticipated to observe surge in the industry expansion during forecast timeframe. Increasing scientific expertise along with the large network of food chemistry, biotechnology and food safety generates high quality curcumin improving their future sales platforms.